The cellist, band lieder and composer Joseph Cherniavsky, born 31 March, 1894 in Lubny in the Poltava district of Ukraine, is a perfect example of a musician who grew up and was trained as a klezmer, left the klezmer milieu to further his training as a classical musician, returning as a adult to klezmer and Yiddish music not because of a necessity, but out of a love for the genre. Cherniavsky had yikhes (a good family pedigree) : his grandfather was reputed to have been none other than the real-life prototype for Sholom Aleichem Stempenyu. At the age of ten, Cherniavsky studied in Odessa with his uncle, violinist Alexander Fiedelman, most famous for having taught Mischa Elman. He then attended the St.Petersburg Conservatory (graduated with a Gold Medal), where he studied cello and conducting as a student of Alexander Glazounov and Nikolai Rimsky-Korsakov. Afterwards Cherniavsky continuing his studies in Leipzig with Professor Julius Klengel, the teacher of Emmanuel Feuermann and Gregor Piatigorsky. After immigrating to New York, Cherniavsky began an association with Maurice Schwartz and his Yiddish Art Theatre. The first team-work's production was Cherniavsky play Moishe der fiddler produced by Schwartz on 21 April, 1920. The next theatrical season Yiddish Art Theatre had open with the Shloyme An-ski's popular play The Dibbuk, first performed on 1 September, 1921. The musical score was written by Joseph Cherniavsky. 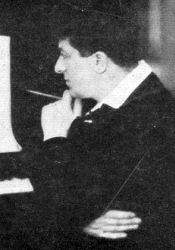 His next work, in collaboration with Julius Adler, was a musical score for Moishe Nadir's Der Letster Yid performed on 2 November, 1921. In 1922 Cherniavsky had established Hassidiche (later Yiddishe) American Jazz Band. The band toured American and Jewish vaudeville circuit extensively. Although billed as a "Jazz-Band", there is nothing jazzy about either the music or the instrumentation of Cherniavsky's Yiddishe Jazz Band, which does not differ from the typical larger klezmer or Yiddish Theatre ensembles of the early 1920s. But there also was and a little difference : the staff. 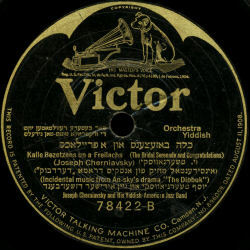 With Joseph Cherniavsky on cello and his wife Dora (Lara) Cherniavsky on piano, Naftule Brandwein (lately replaced by young Dave Tarras), Shloimke (Sam) Beckerman on clarinets with addition of Philip Greenberg it was maybe most starry klezmer ensemble in history. In 1923-1924 theatrical season Joseph Cherniavsky wrote music for Boris Thomashefsky and his Broadway Theater operettas Di dray kleyne bizneslayt and Tanz, gezang un wein. In the late of 1920s Cherniavsky moved to Hollywood, where he wrote the musical score for a Show Boat movie in 1929. He toured the USA as a conductor in theatres and in concerts. He also created and conducted the NBC Radio program "Musical Camera" in New York. Joseph Cherniavsky died at 3 November 1959 in New York.